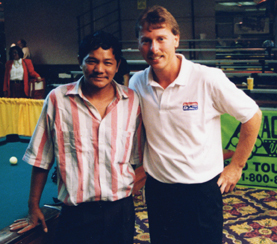 Reyes Stuns Strickland in Reno with "The Shot"
1995 Sands Regency 9-Ball Open XXI . June 11, 1995 . Reno, Nev. Baseball's got Bobby Thomson's "The Shot Heard Round the World." Football has "The Catch" by Dwight Clark. For pool, what better person to perform "The Shot" than Efren Reyes? His two-rail kick in the final of the 1995 Sands Regency Open XXI is considered by many to be the greatest shot in the history of the game. The shot was equal parts skill, creativity and good fortune, coming in the case game of a major Professional Billiard Tour event. But this is the 18th greatest final match of the last 30 years, and Efren's little doozy was the exclamation point on a classic conflict between two living legends. Reyes made quick work of the 67-player field, topping George Breedlove and Johnny Archer before topping Strickland for the hot-seat. The undefeated run into the final meant Reyes would be in his fourth Sands Regency final, though still looking for his first title. The two heavyweights traded racks through the first 20 games of the race-to-13 final. Neither player could manage a lead bigger than two games. With an 11-9 advantage, Reyes didn't have a shot after the break, so he sent the 2 down table and dropped the cue ball behind another cluster. Strickland fouled, and Reyes cleared the table to get within a rack of victory, 12-9. But Strickland eked out two safety battles, then ran out to join Reyes on the hill. After Strickland played safe, Reyes struggled to break up a cluster, eventually losing shape. He was forced to play safe on the 5. Stunning the cue ball behind the 6, Reyes sent the 5 downtable ... only the 5 inadvertantly kissed the 8 into the corner pocket. That utterly cruel safety meant for Strickland was now sitting in front of its creator. Two balls later, Strickland conceded the 9-ball and raised Efren's hand in the air, making it clear to everyone who was the champion. Strickland was gracious in defeat, losing the case game on maybe the greatest shot ever. "This shot is sure to go down in pool history, with all the circumstances involved," a gracious Strickland said after the match. Even Reyes was a bit scattered from the miracle shot. "I thought I'd lost the match when I saw the 5 ball on the end rail," he said after the match. "I didn't think I could make the ball, I just wanted to hit it." Even today, as Reyes claims he was going for it all along, he knows how much of a Hail Mary it really was. "It was a do-or-die shot," he said. "I was really going for it, thinking that I had a slim chance." And for the Magician, there is a very big difference between slim and none.